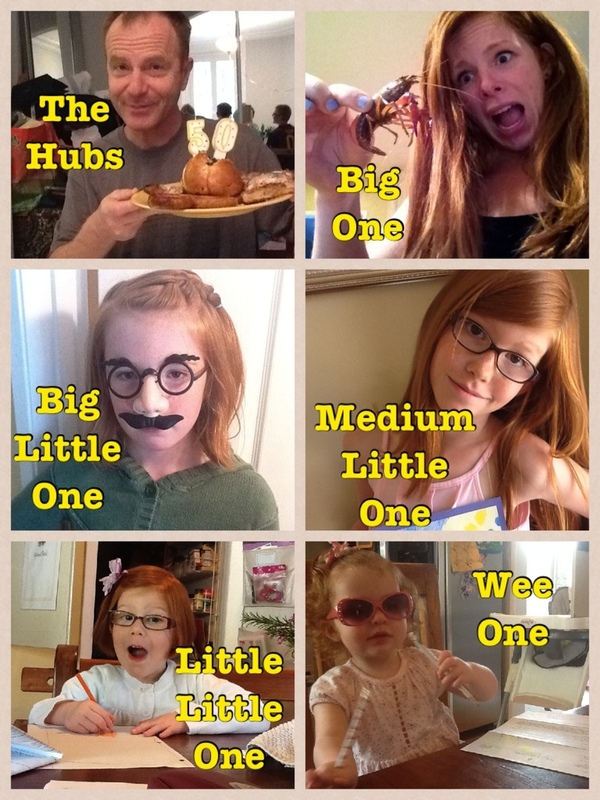 I have always jokingly said that I needed to get just one shy kid. Just one who isn’t loud. Just one who at least hesitates before interrupting a conversation. Just one who wants to be a behind the scenes kind of person. So far, that’s not the hand we’ve been dealt. Exactly NONE of my offspring are lacking in confidence! I think that’s the other politically correct way of saying I have “strong willed” children. Now I’m hoping that will serve them all very well someday. I often say (about one child in particular), that she’s either going to do something amazing with her life, or . . . we’ll be visiting her in prison in the future. Let’s just keep praying that we end up with the first option. I started thinking recently, about where that abundance of confidence comes from. As with the old nature vs. nurture debate, I guess a lot of it is just in their DNA. And then there are the things we do, say, or model for them that goes into the mix as well. Just yesterday I took Little Little One to participate in a toy study. If you’re not familiar with that term it’s really just a focus group. I schlepped my 4 year old 20 minutes out the 5 freeway to a marketing agency where she sat at a computer and pointed out which toys she liked best. In exchange for her opinions she received 15 bucks and a Polly Pocket Tropical Party Yacht. Not a bad gig when you’re four. And I think it sends the message “Your opinion counts and people want to hear what you have to say” pretty clearly. Actually though, it wasn’t quite as straightforward as that. The way the study was structured went like this: 1) show 4 year old little girls a computer screen with 4 images on it 2) have each girl select which thing / toy she would take home IF she could choose just one 3) repeat this with about 8 other sets of 4 options 4) show a series of commercials for select products within each group 5) repeat same series of commercials 6) repeat selection process. I’m pretty certain the point was to see which, if any, girls would change their selections after watching certain commercials. Fascinating if you ask me. So here’s what it makes me want to do – run out and make commercials for zucchini, ads for artichokes, and public service announcements for family dinners together! Seriously. How could the eating in our country change if our kids were bombarded with ads for carrots and squash and salmon? What if all the ads for foodlike substances were just replaced with commercials for real fruits and vegetables. There you have it, my 30 seconds of Eutopian dreaming. But the farmers growing our produce organically and locally don’t have a Kool Aid, M&Ms or Doritos marketing budget. Bummer. In the meantime, all any of us can do is be our own commercials. 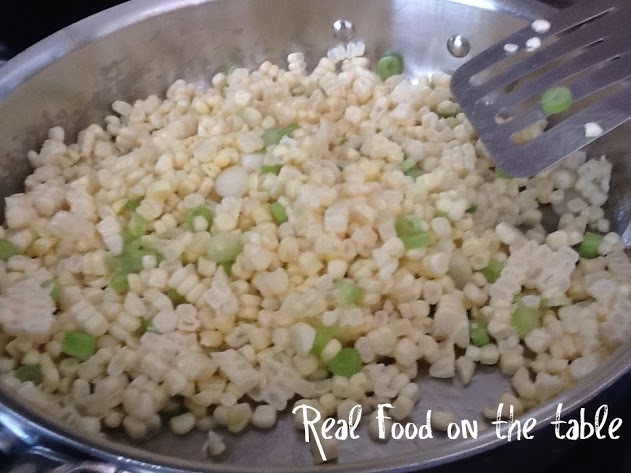 We can show our kiddos what real food is; let them see it, feel it, smell it and taste it. Educate them like a public service announcement would about the “bad ingredients” and chemicals in processed foods. Though we don’t feel like it on most days, we are our kids’ biggest heroes. Their eyes are always looking to us to decide what to say, how to act, how to treat others, and yes . . . what to eat. So make your commercial a good one and you could give your kid an amazing gift – the joy of eating real food and enjoying the resulting health benefits. And now, a word from our sponsor. Salmon – it’s better than a chicken nugget any day! This particular salmon was accompanied by a corn and roasted red pepper relish. 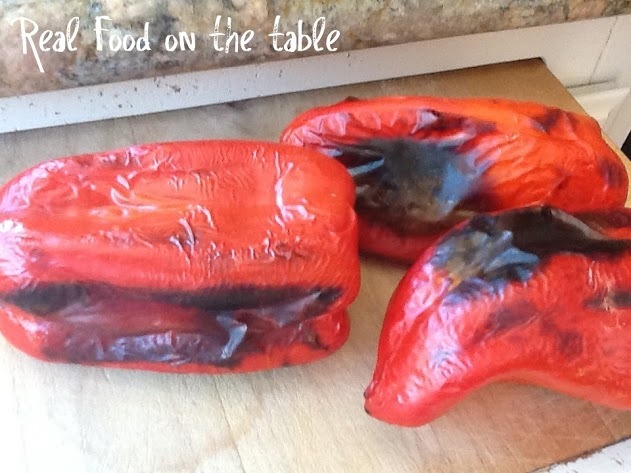 To start with I charred a few red bell peppers under the broiler, then popped them in a paper bag, let them rest for 10 minutes, and then chopped. 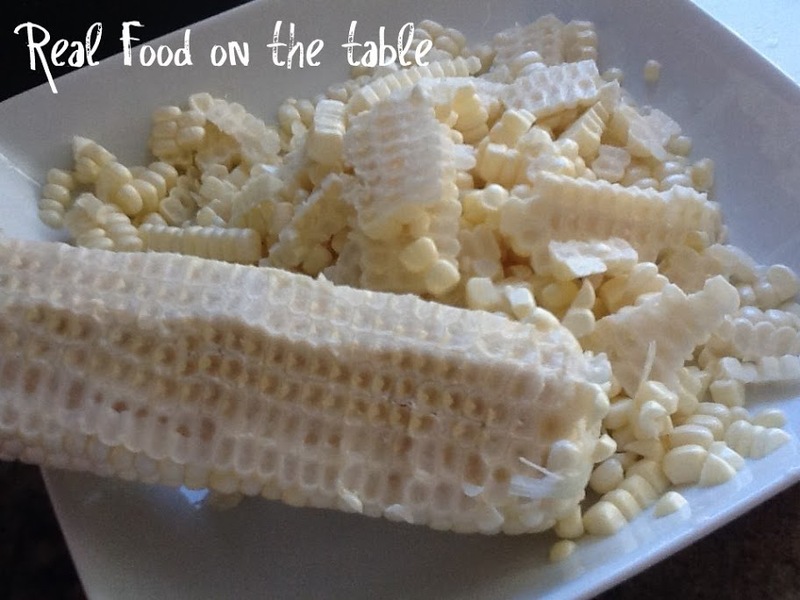 I then took about 4 fresh ears of corn and cut the kernels from the cob. I sauteed the corn with some scallions, and then threw in some scallions and minced garlic. I then added a little white wine. 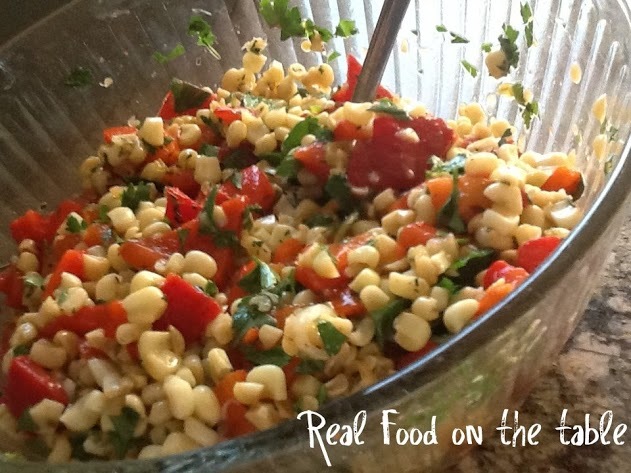 To the corn mixture I added the chopped roasted peppers, a little honey, some lemon juice, a bit of olive oil, fresh thyme, and a touch of coriander. The relish was done (except for adding some Italian parsley which I did just prior to serving). For the salmon filets, I combined olive oil, lemon juice, honey, paprika, salt and coriander. I brushed the filets with this sauce and then placed on a baking sheet covered with foil. 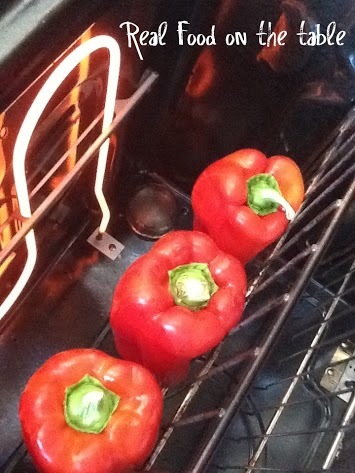 I roasted at 400 degrees for about 12 minutes – just until the fish was opaque in the center. 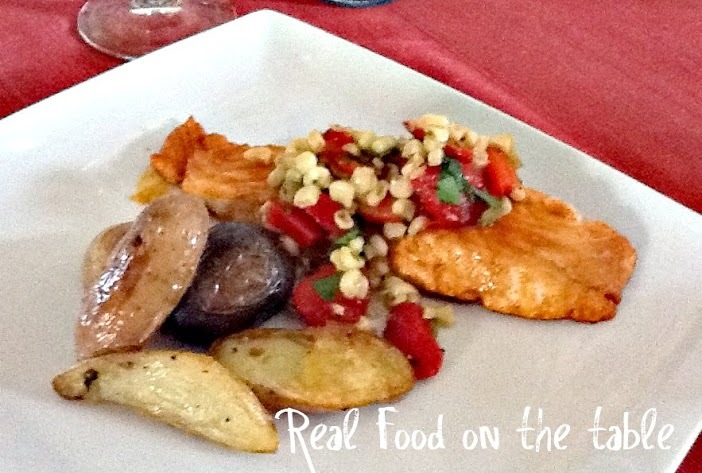 I served the salmon with the tomato and corn relish spooned over the top and accompanied by some roasted potatoes. I really enjoyed the relish which went with the fish. Surprisingly, the kiddos raved about the glaze. They liked the relish well enough, but just loved the simple glaze. If I’m ever in a pinch for time, I think I would pull this one out again and just roast with the honey, lemon, olive oil, paprika & coriander glaze. 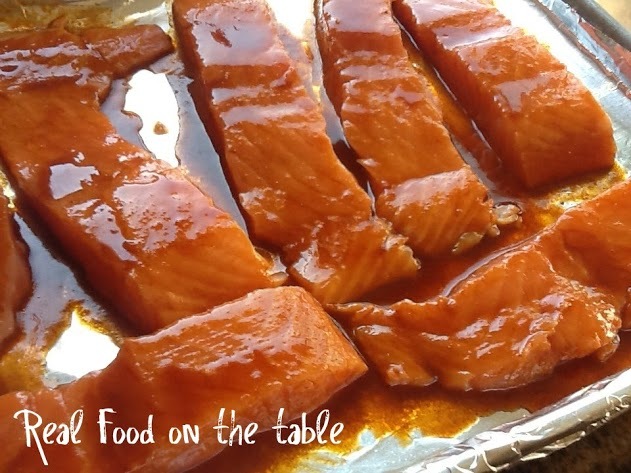 Interested in other salmon recipes? Have fun browsing through these.